Hawaii Bio-Waste Systems Inc. (HBW) is in the business of transportation, treatment and disposal of all streams of medical waste generated by medical, dental, veterinary laboratory and pharmaceutical facilities. These facilities include all private as well as federal, state, county and city facilities. 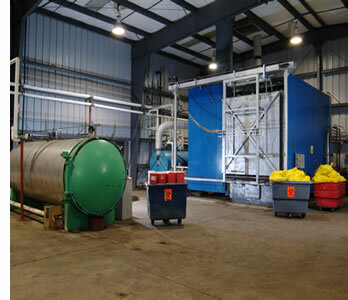 HBW provides innovative, economical and environmentally sound solutions for any disposal problem. We also provide medical waste consulting and management for both private and public sector clients. Our state of the art treatment facility on Oahu was completed in 2000 and treats more regulated waste than any other company in Hawaii. The facility processes over 1000 tons of waste annually, much of it from the neighbor islands from which we ship containers weekly to Oahu. © Hawaii Biowaste Systems, Inc. - All Rights Reserved.